Those little munchkins, helpers of the big happy guy! Here is what our designer came up with! Designer Melin used the FREE Kid’s carrying tree Vintage Graphic on this card. She also used a frame from the essentials frame work cutting file set from PCW. Midnight Confessions and Mocha Mama Chalk Inks from Quick Quotes. REMINDER!!! Each of these sponsors have some great discounts available for our event. Please see below for the codes and or our SPONSORS page for all the details!!! One Paper Stack Each Week! - You need to leave at least one comment on at least one of the posts during the prize dates. Formatted In: AI, DXF, EPS, GSD, KNK, MTC, SCUT2, SCAL 2.0, WPC and PDF for manual-hand cutting. Free until December 4th, 2011 at 9am, USA eastern time. Free until December 4th 2011 at 9am, USA eastern time. These are the low res versions. Click the add to cart button below to download folder containing the printable quality versions. DON’T FORGET TO LEAVE A COMMENT And BE A FOLLOWER for a chance to win all those great prizes!!! Fantastic.....you have such wonderful ideas...and that allows us to expand on them. Thanks for the files and time it takes you to create them for us. Great projects from everyone. Brilliant free files, thanks. Wow!! All the Santa Helpers projects are too Cute! Everyone did a great job. I need to go back an check out Day 1 & 2 I have been so busy. I'm loving these vintage Christmas graphics!! What great projects and I am loving these free files. Thanks so much for sharing and the chance to win. These little helpers are adorable..thank you for sharing..
these are so cute!! Thanks so much for sharing and a wonderful HOP!! I am so glad I found it on day 1. Thanks again for the little helper file!! How fun!! I love this and to see Yolie and Celeste as well as the other designers makes me so happy. I love to have a chance to win! Very talented ladies! Thanks for all the freebies! Very cute files. Thanks for the freebies too. great projects by all. i'm a new follower. found you via funky cards. Thanks for the inspiration. There will be happy people getting cards inspired from this site. Great designs. 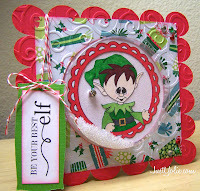 Such a fun LO JennyR designed but all the projects are wonderful and the little elves make me smile. Thanks for all the great inspiration and for all the freebies. I will have to take a look everyday and see what is going on. Plus I have to say that you have the best name ever..... lol.... I only know a few Melinda's, besides myself. All the items are so cute. Love the scrappage layout for Jolly Holidays that's just so cute and really adds a great touch for a child layout. Thanks for sharing it all! Great designs...so much creativity..thanks for the wonderful freebies..
Wow what a wonderful job! Love all the designs. Thanks for the freebies! Great cards! I love the digital elf, he is so cute! First I have to say "Hi Yolie"
And to all the designers. Thank you so much for sharing these great files with us. All the projects were so cute. How adorable those elves are!! I'm loving the 25 days of Christmas - thank you for the inspiration, as well as the chance to win awesome prizes! Darling little elf helper! Thanks for the files and creativity! Fabulous projects! Seeing all these cute little helpers just puts me in a happy happy state of mind. These gifts are wonderful. I used one of the previous downloads in a card I made and it looks great. Thank you so much. Such cute projects. Love the vintage kids -- again! Lol! Thanks! Love the little fellows and gals! Very cute. Thank you again for sharing. Love the vintage look, and I am so excited about the chance to win! Your files have always worked great for me. thanks for another day full of amazing projects and the great cut file! thanks for the lovely graphic! Like the Elf creations. Please make sure some of these Elves keep me on the Nice list so Santa will bring me what I want for Christmas. AMAZING projects DT!!! You chefs are simply wonderful. I just love working with such fabulous ladies:) TFS!!!! Everyone is doing an awesome job!!! Thanks! Another fabulous day of great inspirational projects and the wonderful freebies. I'm just so happy to have found your sight and getting in on the 25 Days of Christmas Crafting fun!!!! Thank you!!!! Oh, what a super cute elf! Love the scrapbook layouts and all the cards. Very creative and inspiring! Thanks for the freebies. I love all the projects. Super Cute!!! As always, perfect. Thank you for another amazing project. You are so talented. Thanks for the chance at these great giveaways. Thank you for the holiday graphics. They are very nice. Again awesome projects and freebies. Thank you all so much. I am a follower. Great job ladies! ... I am partial to layout so I really really like the layout! Thanks for the vintage files Melin! Wonderful inspiration!! I am loving this! Thank you so much for the free cutting files!! It's so kind of you to offer these darling images!! I am loving the vintage kids, I know I will use them in the future. Love these freebies! from a long time follower! Great projects by the Design Team! I love the Vintage kids! Thanks for the freebies! Great projects. Thanks for the chance for a prize, I'd love the Close to My Heart set! I love 'em all! Thanks for adding to the Christmas fun! I love the projects and the elves are precious!! Santa Helper...what a wonderful theme for the day! Thanks so much for a great give away! I especially love the vintage children. You always post such cute things. They make me smile. Thanks! Fantastic and soooo cute. Hoping that Mr.Elf will remember ll the children everyone on Christmas Day. Please send one of these cute little Santa helpers to my house. I need one so bad!!! They are all so sweet. I AM SOOOO LOVING ALL THESE CUTE ELVES..